THE MODEL OF THE PEABODY-OUTRAM ''LIVING BRIDGE OF BOATS'. The 'blade of light' bridge has exactly those qualities that Camillo Sitte said, in the 1890's, were characteristic of 'Modern Man'. He described these as a total lack (amounting to a lost 'factor x') of the understandings that had led to the qualities he both admired, and described, with great accuracy, in the Mediaevo-Humanist cities of Europe - especially Italy. Sitte, however, and it is to his credit that he admitted this openly, completely failed to create any intellectually persuasive explanation of how the 'magic' of these cities was arrived at. Hence his recourse to the 'factor 'x' argument - always a sign that the book can be closed and put away because its author has given up any attempt at Science. I, on the contrary, have forged a theory as to how such cities were formed. It was published, along with a signal lack of interest in its findings by the Architect in the room next door, Norman (as he was then) Foster, in the Venice Architectural Biennale of 1991. This is partly to explain why I was very happy to curve my bridge design, and block the full-frontal view of the Dome of St. Pauls that the 'blade of light' keeps in view with all of the stolid obsession of a viewer gazing into the headlights of an oncoming truck. "Will the Dome wipe him out?. Will it be there for ever, preventing the "Modern Skyscraper" version of the City of London from ever being built-up as hugely as New York?" The "blade of light" aims its sharp weapon at the Dome like a gunshot that might puncture its ballooning profile, making way for something 'leaner', 'fitter', and far more pointy-headed - the 'brush-cut' city of Fullerspeak. 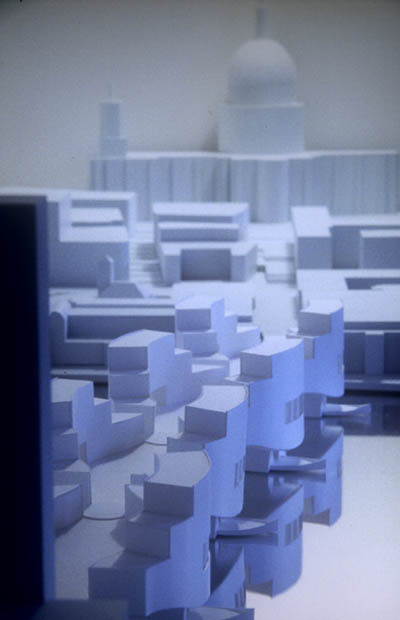 Peabody "Inhabited Bridge" Competition, 1995-6.